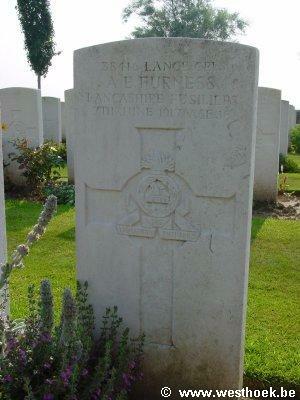 Lance Corporal ALBERT EDGAR FURNESS 38416 11th Bn ., Lancashire Fusiliers who died on Thursday 7 June 1917. Age 16. Lance Corporal ALBERT EDGAR FURNESS 38416 11th Bn ., Lancashire Fusiliers who died on Thursday 7 June 1917. Age 16. Son of Mrs. M. S. Shepherd, of "Greenroyd", Watling St. Rd., Fulwood, Preston. MESSINES RIDGE BRITISH CEMETERY Grave II. E. 20.